Just for a moment, forget about the big four — your mayflies, your caddis, your stoneflies, your midges. What happens when the water slows down? What happens when it’s just you, a float tube, and a lazy July day on the lake? Yes, hatches do burst, explode, turn into events, but what bursts must also fade away — leaving the unglamorous meat-and-potatoes of the trout diet, such presumed snoozes as the scuds and the damselfly nymphs. Talk to some odonata connoisseurs and you’ll find more than a few blown minds. 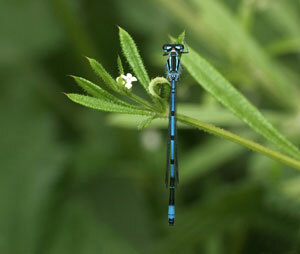 What’s so great about damselflies? “THEIR SECONDARY GENITALIA — OR MORE PRECISELY, THAT THEIR SPERM-TRANSFER lOGISTICS EVOLVED INTO THIS SEPARATE STORAGE AND TRANSFER ORGAN,” e-mailed Bob Honig, a zoologist, photographer, and all-caps kind of guy in Houston, Texas. Honig’s wife, a biologist named Maggie, sang praises of the “killer lip” — the damselfly nymph’s lightning-fast jaw mechanism that extends a good third of a body length to snag a snack (which sometimes includes small fish or other odonata nymphs). 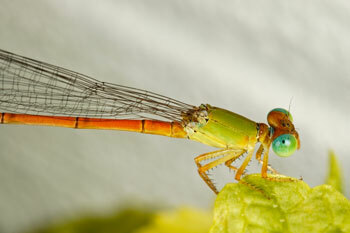 Both damselflies and dragonflies are some 300 million years old, and in prehistoric times, had wingspans of 30 inches. (According to one surely legit website, they were “as big as hawks.”) In Germany alone, odonata have had over 150 nicknames — water witch, goddess’ horse, snake killer — and elsewhere, some believed that the Devil used them to weigh a person’s soul. 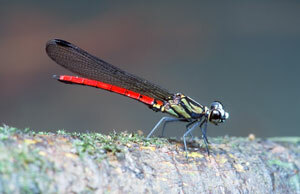 Their true common names are entomological poetry: Powdered Dancer, Citrine, Forktail, Flamehead Sprite, Ebony Jewelwing. The males’ colors push the unnatural end of the natural envelope — stop-sign reds, shining bronzes, iridescent blacks tiger-striped with some of the purest eye-searing turquoise in the animal kingdom. And that’s where the angler should go stalking as well: where the water moves slowly, if at all: where long stems arch over the shallows; where the fireworks hatches have come on and gone and the summer sun warms the cold-blooded, as ever, the fish still need to fill their bellies.